Using the mulled wine sachet gives this combination of fresh and dried fruit a warming, Christmassy flavour. To save time, you can use Waitrose Ready-Made Mulled Wine and omit the mulled wine sachet and add extra sugar only if desired. Pour the wine into a large saucepan and add the sugar and mulled wine sachet Bring slowly to the boil, stirring to dissolve the sugar. Add the apricots and cranberries and simmer for 20 minutes, until softened. Then add the pineapple and simmer for 5 minutes. 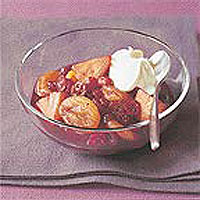 Remove the mulled wine sachet and serve with thick cream or Waitrose White Chocolate Ice Cream. You can make this dessert a day or two ahead and store it in a covered container in the fridge or freeze for up to a month. Vary the dried fruit if you like - try Waitrose Dried Fruit Orchard Medley - but keep the pineapple for its texture and flavour.